Candy Cane Joe-Joe's Are Back! More than miniature twinkling lights or The Little Drummer Boy blaring from every boutique, the surest sign the Christmas season has arrived is the return of Candy Cane Joe-Joe's -- or, as they're known on the street, Christmas Crack. 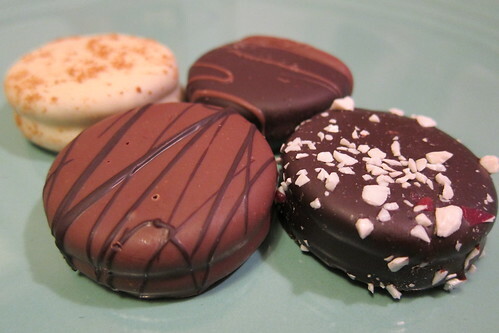 Thanks in part to their seasonal nature, these ersatz Oreos have climbed to the top of a long list of Trader Joe's most addictive snacks, beating perennial favorites like peanut butter-filled pretzels and dark chocolate-covered cranberries. TJ's takes the standard white frosting and studs it with peppermint candy cane chips then dips the chocolate cookie sandwich into more chocolate, transforming it into the cookie equivalent of PCP + cocaine + heroin. 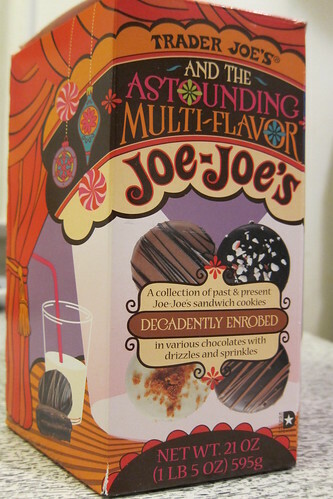 This year, they've added a new twist, packaging them with three other types of specialty Joe-Joe's, none nearly as good as the Candy Cane variety but all "decadently enrobed" in various chocolates. A noble spirit embiggens the smallest cookie.